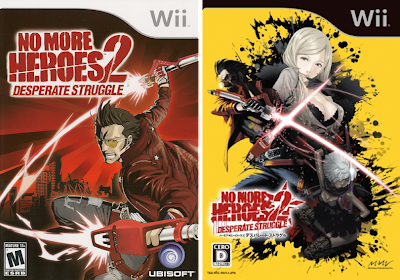 Although North American gamers have been gazing the art that appears on the cover of their version of No More Heroes 2: Desperate Struggle for the better part of the year, their Japanese counterparts are just now getting a look at the art that will appear on their version of the Grasshopper-developed title when it hits store shelves on their shores in late October. The North American box art is on the left, by the way, and the Japanese art is on the right. As for my two cents: I like both covers, but I think I like the North American one just a bit more--mainly because it seems to convey the game's "rated M for mature" content better than the Japanese art. I really like the COLOR of the Japanese box art. And it gives a little more insight into how the game works, but only if you actually know or have played it. Yeah, I like the yellow, too -- it reminds me of 'Kill Bill,' which seems appropriate given what I've heard about the game.